Since making his debut in The CW’s The Flash season four, Hartley Sawyer’s quickly become a fan favorite. His character, Ralph Dibny/Elongated Man, was so popular with fans that Sawyer’s been elevated to a series regular for the show’s fifth season. 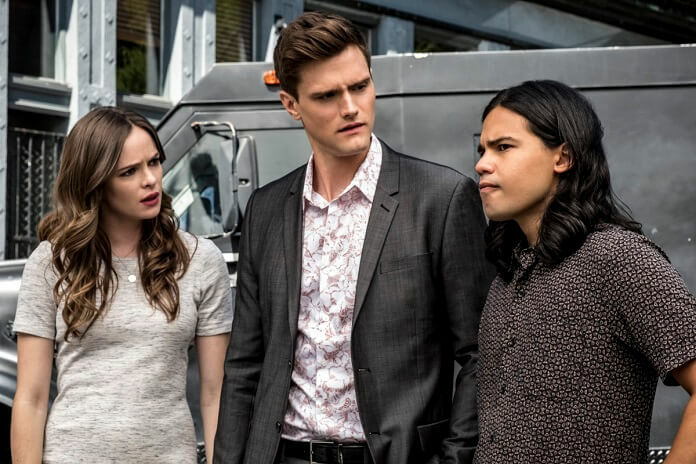 The cast of The Flash are San Diego Comic Con veterans, however the 2018 Con marked Hartley Sawyer’s first time joining Team Flash at the sold-out convention. During our roundtable interviews, he talked about his experiences with fans as well as his hopes for Ralph in season five. Congratulations on becoming a series regular on the show. Since you’ll have more time with Ralph, are there any aspects of him you hope you get to play with more this season? Will there be a new version of the Elongated Man suit this season? Are we going to see more of the Ralph and Barry dynamic that we saw from last season? At first, they almost couldn’t stand each other but then they became like brothers. Hartley Sawyer: “That’s sort of what they are. I don’t think we’re going to see as much of that, at least in the first part of the season, because he’s going to be up to his eyeballs with Nora – with his daughter. They’re going to be figuring that out. Since Barry’s going to be so busy, who do you hope Ralph interacts with more on the show? Hartley Sawyer: “I would love to see…there’s going to be a lot of Ralph and Caitlin, which I really like. I think that’s a really sweet relationship and friendship that they have. There’s going to be a lot of Ralph and Cisco since they’re bachelors now and single. And Ralph had a major impact on Joe when he was about to cross that line. Hartley Sawyer: “Great scene. That was such a pivotal scene for the character. That was something that really kind of drew the line in the sand, I think, for a lot of viewers and for me as an actor. I was like, ‘Cool. This is really going to dig into who this guy really is.’ There’s a lot more there than just the wackiness. What’s Ralph’s main focus this season? Does the new season feel any different given the changes behind the scenes? Hartley Sawyer: “It just feels like the same thing going to work. It really does. It feels like the same thing as last year – just like a natural progression of things. I know the scripts changed a little bit, the tone’s changed a little bit. The reason this show works is because of the people working together. Working with Grant (Gustin), working with Carlos (Valdes), working with Tom – all those people. Those relationships are always there. I think that’s why this show worked in the first place. I really do. I mean even going back way, way before my time here. It’s because these people really like each other and they’re all really good people and they get along. I think that came through on camera and on TV screens. I really, really do. What’s your experience been like with the passionate fandom?